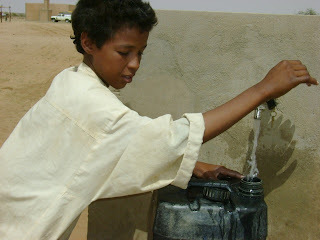 You may wonder how life in the Azawak would change if the 500,000 people who live there had access to water. 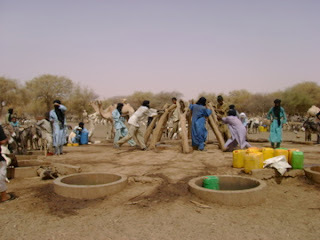 Let's explore...how is life different for the people in Tangarwashane now that they have a working borehole? 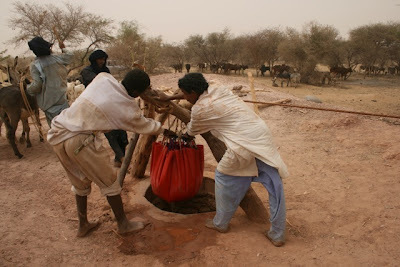 Before the Amman Imman borehole was constructed, the people of Tangarwashane, like other people in the Azawak, traveled to a marsh for their water. Now they get water by turning on a faucet. 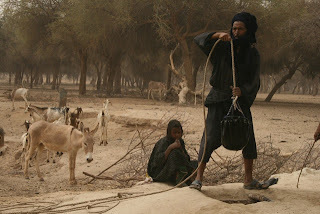 Previously, when the marsh dried up, they traveled long distances to deep wells in search of water. 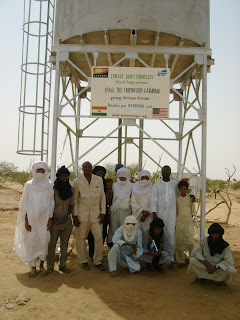 Now, they have a water tower in their village containing 20,000 liters of water. 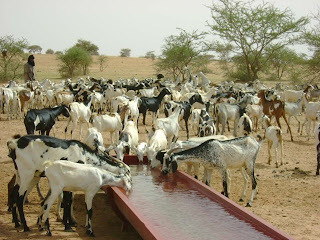 At the deep wells, they relied on donkeys to pull up water from depths as much as 300 feet and more (Do you see the donkeys? Notice the distance they have to pull). 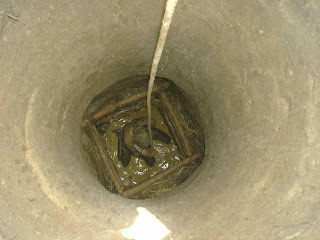 the wells often were dry, or there was not much water in them. 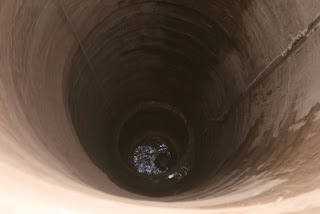 Frequently, people descended to the bottom of the well to dig it deeper in hopes of reaching water. 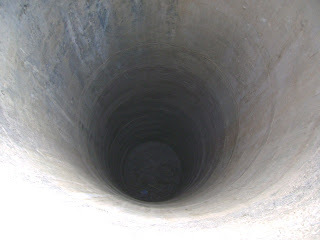 This is very dangerous because the well could cave in. 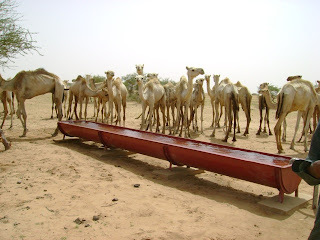 Often there was still no water . 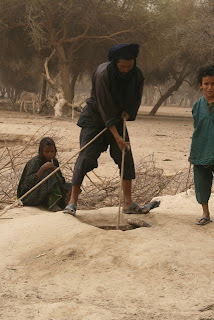 Now, the people in Tangarwashane and the nomads traveling through simply have to turn on a faucet. and shared it with their animals. Now, they turn on a valve for clean and pure water. 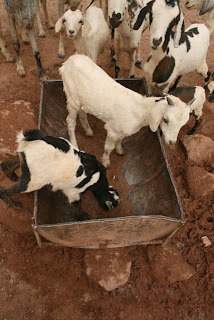 and drink it from their own troughs, separate from the people. or travel long distances to find water. 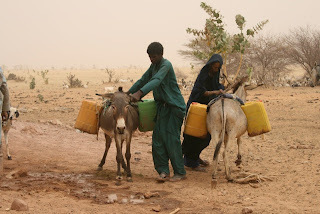 Now that the children don't have to spend all their time traveling for water, perhaps they can attend school. 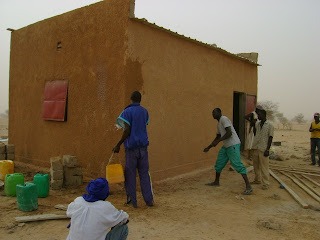 (a school is under construction in this photo). 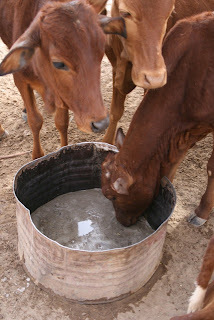 With clean pure water to drink and bathe with, their health is improving. 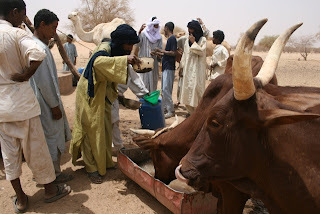 Their families are starting to grow sustenance crops and the livestock herds are increasing, providing more milk. 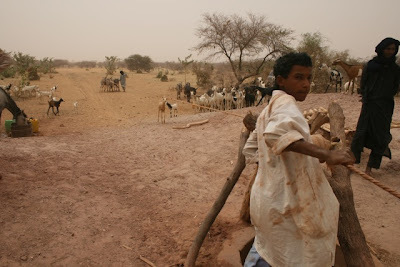 The situation that you see depicted in these photos continues to be a reality for the people of the Azawak. We need your help! 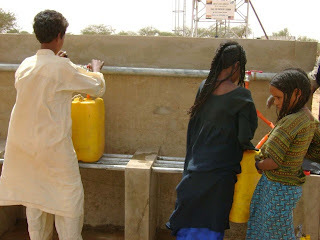 Many more boreholes are needed to meet the needs of the 500,000 people of the Azawak. Please join our effort to save and improve the lives of the people of the Azawak by joining Amman Imman. 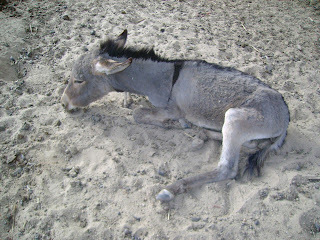 Contact debbie@ammanimman.org for more information on how you can help. 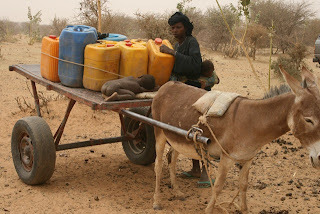 Please donate now at http://www.waterforniger.org/page/donate/main/. 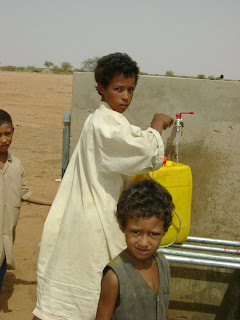 Your dollars will go directly toward saving and improving the lives of the people of the Azawak.